Three devastating wildfires--the Camp, Woolsey, and Hill fires--are burning out of control in California. Firefighters are working around the clock to control the blazes and keep them from spreading into even more communities. More than 250,000 across the state have been forced to flee their homes. Governor Jerry Brown has declared the fires a major disaster, and is requesting federal emergency funds to aid families and communities affected by the fires. 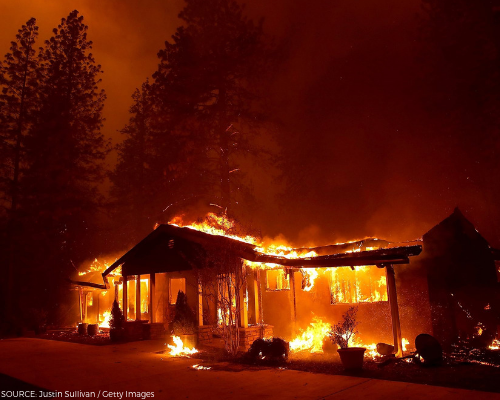 The Camp Fire, which is burning north of of Sacramento, California, destroyed the small city of Paradise and is continuing to spread. The fire has claimed the lives of 77 individuals and hundreds of people are still missing. It has also burned more than 6,700 homes and businesses in Paradise and its surrounding areas. The fire is now tied for the deadliest on record in California state history. At the same time, the Woolsey and Hill fires are raging on in Southern California. The Woolsey Fire claimed the lives of three people near Malibu. The fires have damaged hundreds of homes and beachside resorts.